Neil L. Whitehead, Sverker Finnström, "Virtual War and Magical Death: Technologies and Imaginaries for Terror and Killing"
Virtual War and Magical Death is a provocative examination of the relations between anthropology and contemporary global war. Several arguments unite the collected essays, which are based on ethnographic research in varied locations, including Guatemala, Uganda, and Tanzania, as well as Afghanistan, Pakistan, Iraq, and the United States. Foremost is the contention that modern high-tech warfare—as it is practiced and represented by the military, the media, and civilians—is analogous to rituals of magic and sorcery. 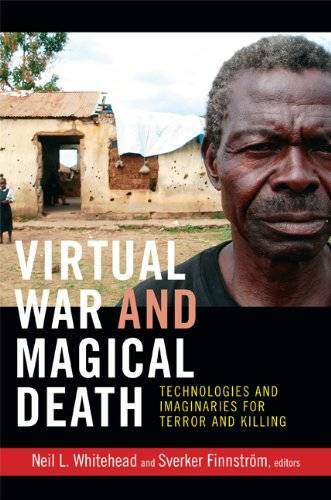 Technologies of "virtual warfare," such as high-altitude bombing, remote drone attacks, night-vision goggles, and even music videoes and computer games that simulate battle, reproduce the imaginative worlds and subjective experiences of witchcraft, magic, and assault sorcery long studied by cultural anthropologists. Another significant focus of the collection is the U.S. military's exploitation of ethnographic research, particularly through its controversial Human Terrain Systems (HTS) Program, which embeds anthropologists as cultural experts in military units. Several pieces address the ethical dilemmas that HTS and other counterinsurgency projects pose for anthropologists. Other essays reveal the relatively small scale of those programs in relation to the military's broader use of, and ambitions for, social scientific data.